3D reconstruction of E13.5 mesenteric vessels showing close association between LEC and extravascular RBC. 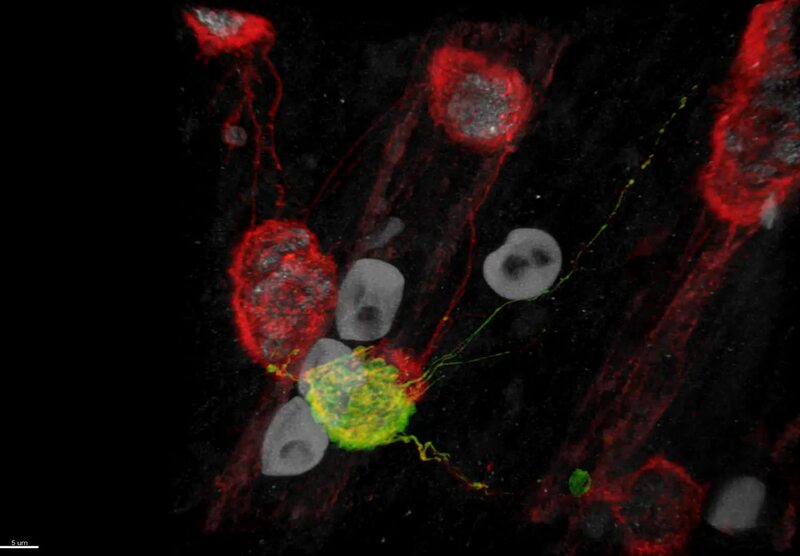 A movie showing 3D reconstruction of deconvolved confocal images of an E13.5 R26-mTmG;Vegfr3-CreERT2 mesentery stained for GFP (green), Nrp2 (red), PROX1 (grey; LEC nuclei) or visualized by autofluorescence (grey; RBC). The image stack was acquired at 0.20 μm intervals covering a z distance of 23.2 μm. 3D surface rendering was applied based on signal intensity to highlight close association of a LEC protrusion and RBC. A corresponding z-projection is shown in Fig. 1F. The movie is displayed at 25 frames per second.